Caption slip reads: "Photographer: Swaim. Date: 1951-09-05. Reporter: Swaim. Assignment: Smallest postoffice, Mt. San Antonio College. K7. 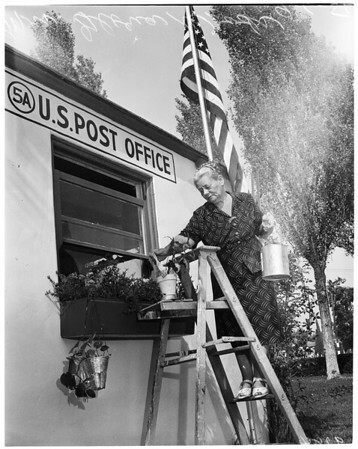 8, 11: Mrs. Gloria Woods, post-mistress, redecorating her 'wee small postoffice' for 5th anniversary of its existence on campus of Mt. San Antonio College, near Pomona. Postoffice, one of world's smallest, has international fame".